It’s time for the annual get together with my dad, my brother, and my best friend from grade school. 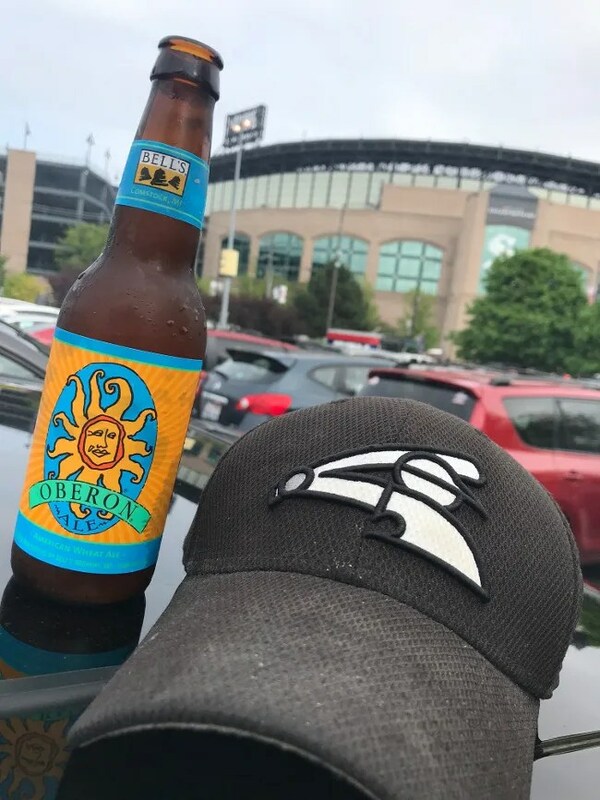 We’ve been getting together once a year for a White Sox game since my bachelor party in 2009. I live in Michigan and my buddy lives near St. Louis so we never see each other. My dad and my brother see him occasionally, but it’s still great to get together every year for this game…no matter how bad the Sox are. Part of this night out at the game is tailgating. Chicago is big on tailgating. It’s the thing I’ve always found so weird at Detroit sporting events. They don’t let you tailgate in the lots near the park. In Chicago, tailgating is just part of the game. You get to the park two hours early when the lots open and drink and eat outside until close to first pitch. We’ve always ordered wings for our tailgates. Back in 2009, I found a great place called Wings Around the World. It went out of business a few years later so we tried a couple of other places. We did whole wings one year which the guys didn’t really like. Then we did a WingStop which was better but still not the same. 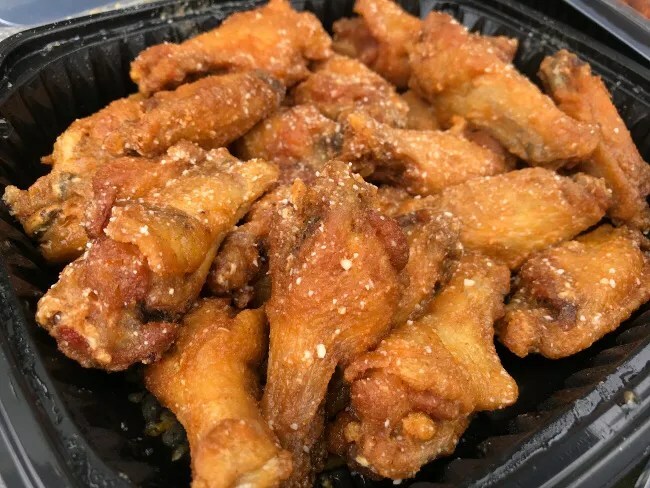 About three years ago, I realized our wing place reopened as Chicago Wingz Around the World. We did that a few more times but the group decided last year the wings were not as good as they have been in the past and they wanted to find something else. 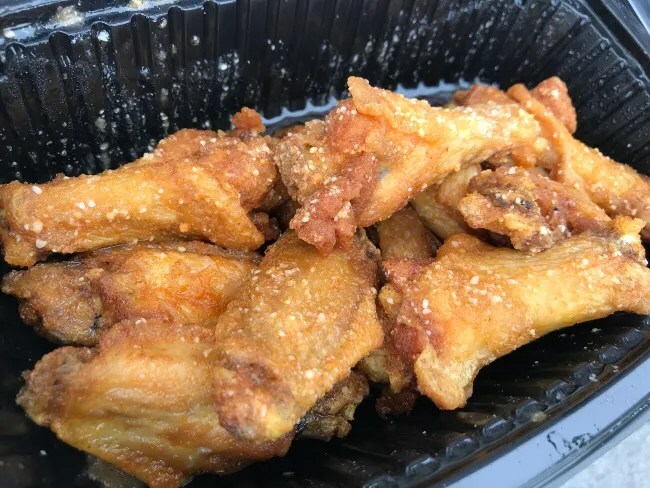 I went searching for a new wing place and gave them three options that weren’t too far out of our way. They collectively decided on a chain close to the park. The flavors looked good and it would be easy for us to pick up before hitting the parking lots. 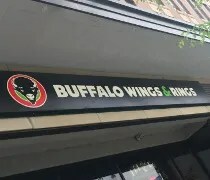 Buffalo Wings and Rings is a Cincinnati based sports bar chain with about 50 locations (none in Michigan). There are three Chicago area locations. We ordered from the one in the city near the corner of 35th Street and Halsted in the Bridgeport Neighborhood. 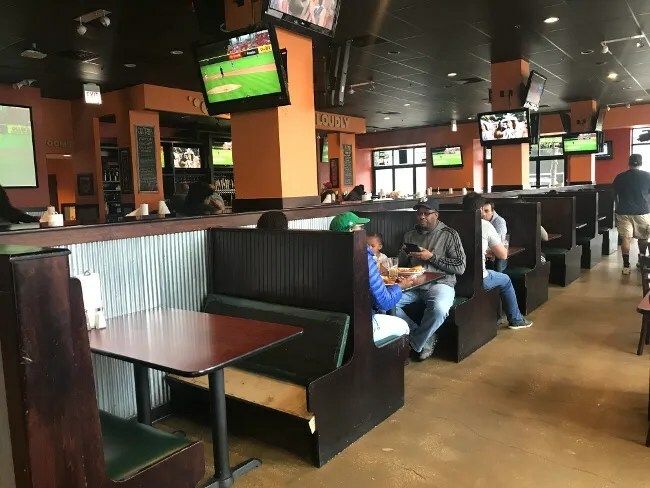 Buffalo Wings and Rings looks like any other sports bar. It’s a pretty large space with semi-private booths, four top tables, and a large bar with variety of local craft and macro beers on tap. And, of course, there are TV’s everywhere. The Cubs game was in extra innings when we stopped in to get our food so despite the fact we were in the heart of the Southside, the Cubs were front and center all throughout the space. Online ordering is available on the Buffalo Wings and Rings website through ChowNow.com. I put in our order pretty early in the morning with a 3:45 pick-up. I didn’t know if it would get busy and we had a pretty big order so I didn’t want to take the chance of our order not being ready in time for us to get to the park right as the parking gates opened. My order was for 60 wings and an order of Onion Rings. The wings were split up between four flavors. Thirty of them were Garlic Parmesan, ten were Bourbon BBQ, ten were Garlic Q, and 10 were Sweet BBQ. The cost for sixty wings and an order of rings came out to a little under $90 with tip. Carry-out order pickups are done right at the host stand just inside the door and my ordering ahead worked. There was a large bag of food waiting for me when I walked in. We got thirty of the Garlic Parmesan wings because it’s the one flavor all four of us really seem to dig. I went right for the large container of wings and grabbed both a drumette and a flat. The wings were big, meaty, crispy, and juicy and covered in a small glaze of a garlic butter sauce. There were little flakes of Parmesan on each of wings but the garlic flavor is what really dominated. There wasn’t a lot of cheese on each wing. I stuck with the garlic flavor and picked up a Garlic Q wing next. These wings are a blend of roasted garlic and BBQ sauce. They were actually pretty lightly sauced compared to the other BBQ flavors, but they were tasty as well. There was s still a pretty good garlic flavor to them with just a hint of sweetness from the BBQ. The sweet BBQ wings were just swimming in sauce that was pooling in the bottom of the to-go container. The BBQ sauce was as advertised..they were nice and sweet. Each wing was a two napkin affair. The last our wing choices was the Bourbon BBQ and this one was really good. 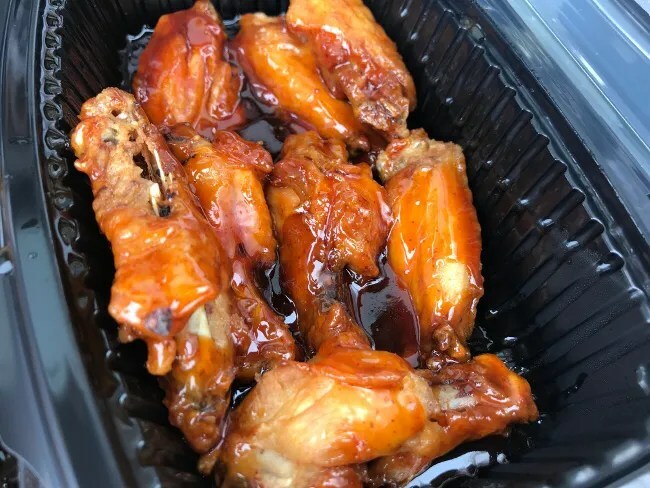 We all kept going back to this container because the wings were so good. We’ll definitely do more than ten of these next time. They were sweet like the Sweet BBQ but had just a hint of a bourbon flavor that made these hard to put down. The wings have just a little bit of kick to them to compliment that sweet BBQ flavor. I didn’t even look at the Onion Rings we got because….well, I don’t like onion rings. My dad said if I did, I would love these rings. The breading was on really well and didn’t rip off with the first bite. There was some kind of southwestern ranch dipping sauce that came along with them. My brother ended up eating most of them. 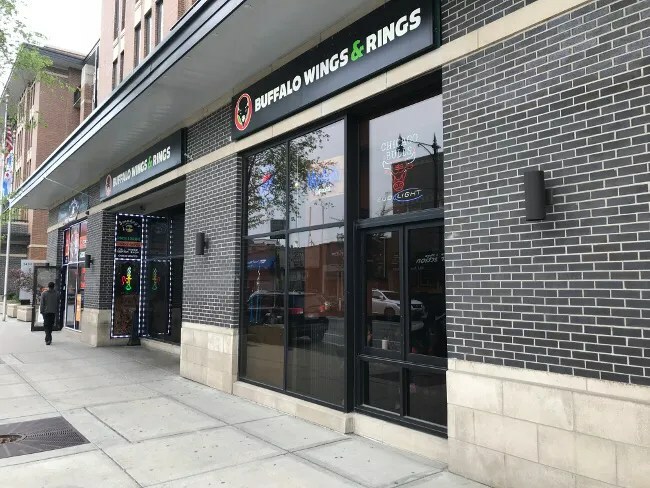 There’s a good chance Buffalo Wings and Rings just became our new pre-game tailgate wing joint. 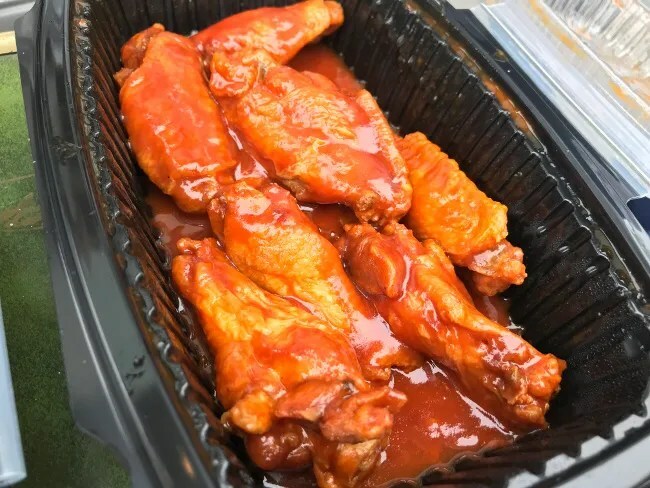 The Bourbon BBQ wings were a huge hit and the rest of the group really liked the ease of ordering and the location compared to some of the other places we’ve tried. My opinion is Buffalo Wings and Rings is it’s pretty similar to the other big name wing place. It’s delicious and they have some great flavor. Consistency is important and that’s what will likely keep us coming back in the years to come.